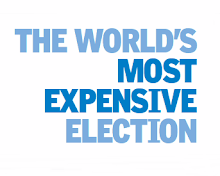 The humble khichdi, a traditional rice and lentil dish, made it to the Guinness book. 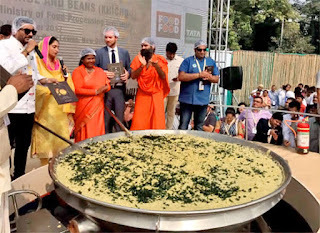 A team of 30 people led by celebrity chef Sanjeev Kapoor cooked 918 kg of khichdi, and thereby entered the Guinness World Records for the largest serving of a beans and rice dish in the world. 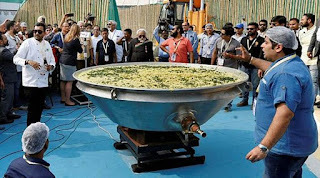 It was prepared overnight in a mammoth kadhai or wok at World Food India festival at India Gate lawns. Hundreds of kilograms of rice, dal, vegetables and spices were mixed to make the dish. “I'm satisfied with our efforts and this dish represents the entire country ,“ Kapoor said, adding that it was made with a lot of love and was a gift of India to the world. He also said that he was proud of all humble things and believed in simplicity, and khichdi, an easy to digest dish, was representative of that. Kapoor said that grains and ingredients from across the country were used in making the dish. “It is a new recipe but we haven't named it yet. I believe food should be used to unite people,“ he said. 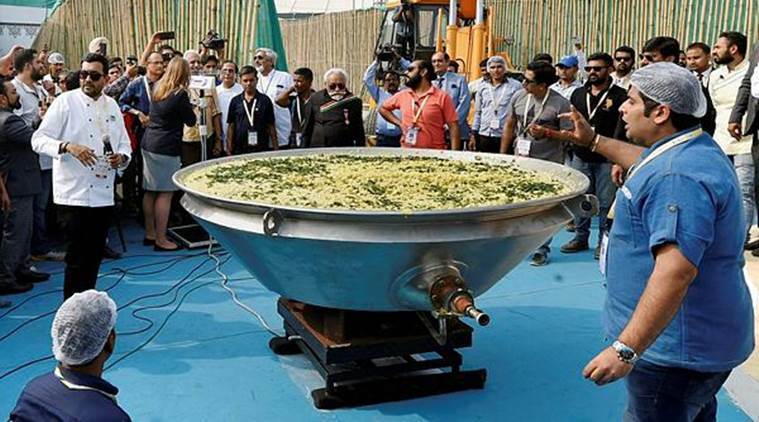 The giant wok in which the khichdi was steam cooked was placed on a tall pedestal, and a crane had to be used to lower the vessel so that it could be weighed by the records officials. Huge spatulas, almost the size of oars, were used to stir the khichdi in the wok. Present at the event were Union food processing minister Harsimrat Kaur Badal and yoga guru Baba Ramdev, who added finishing touches and tadka to the dish. 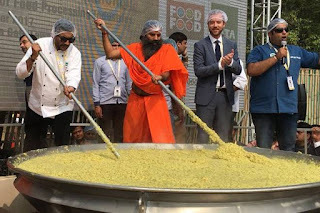 “Khichdi is a complete food in itself as it contains all nutrients and it is a gift to the world from India on the day of Gurpurab,“ Baba Ramdev said. 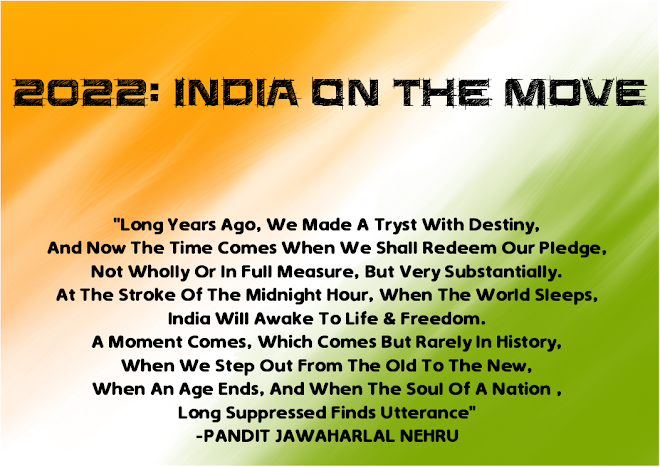 “Khichdi is the recipe for good health and we would present it to the entire world. It is Indian super food,“ he said. “This homemade food would now be known all over the world,“ Badal said. 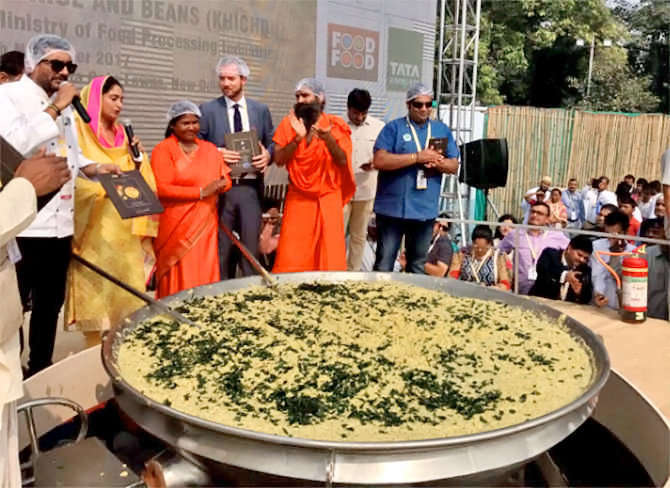 A portion of the dish prepared on Saturday is expected to be packed and sent to heads of foreign missions, along with a book on khichdi, which was unveiled on Saturday . Chef Akshay Nayyar, who helped in preparing the dish and was the master of ceremony on Saturday. Most of the dish would be distributed to the poor through different NGOs.